In less than a week we will be celebrating Valentine's Day?! Can you believe it? This month has positively flown by. 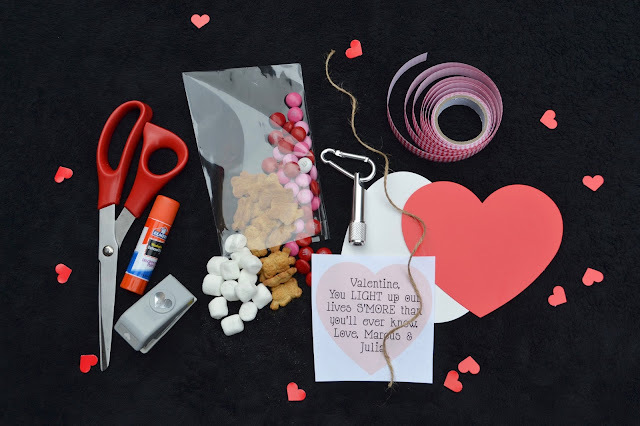 To prep for the lovely holiday we have been trucking away, baking all the Valentine's goodies, crafting all the Valentine's crafts, and making all the Valentine's to send out for a bloggers Valentine swap. There were grand plansto have Marcus help me with our Valentine's. But, in reality he helped slap on a bit of glue, added a few stickers, and he was pretty much good with the whole thing. 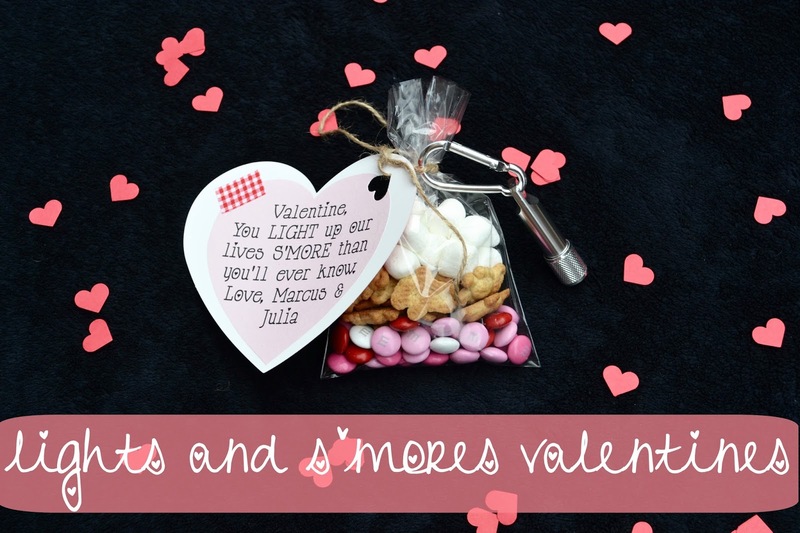 Crafting just isn't his thing - and that's ok.
My inspiration for our Valentines came from wanting to incorporate mini flash lights and on-the-go s'mores. With those two things in mind, "You LIGHT Up Our Live S'MORE Than You'll Ever Know" was born. Putting together the actual Valentine was quite easy. 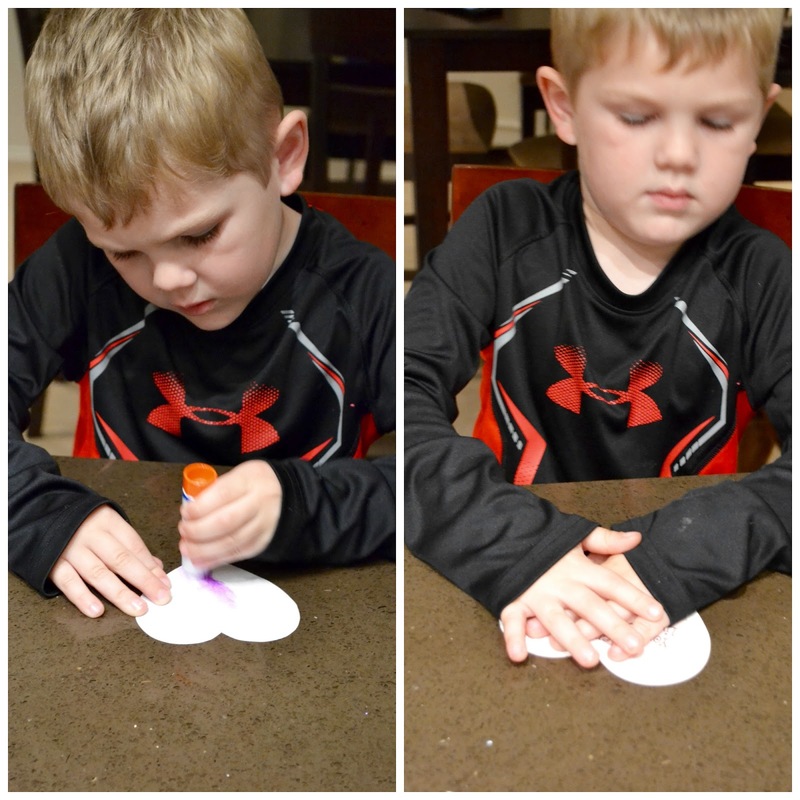 Cut out print of Lights/S'mores saying and glue to red card stock heart. Punch a hole near the top of the red heart, and add a small piece of washi tap to the heart (place washi tape where ever you think it looks best - I chose the upper left corner of the heart). Fill cookie bag with M&Ms, Teddy Grahams and Marshmallows (heaviest on bottom, lightest on top). Tie bag closed with twine, then slip the flashlight on to the twine. Loop twine through the hole punched in the red heart and loosely tie in a knot. The s'more, flashlight and heart should all be intertwined. I was incredibly pleased with how our little Valentine's turned out, and I hope our recipients were, too! Perhaps the most fun part of this exchange was going to the mailbox every day with Marcus to see if any goodies had arrived for him. He was tickled when a few parcels of mail were in our box each day. We have little patience, so we opened the Valentines as they arrived. 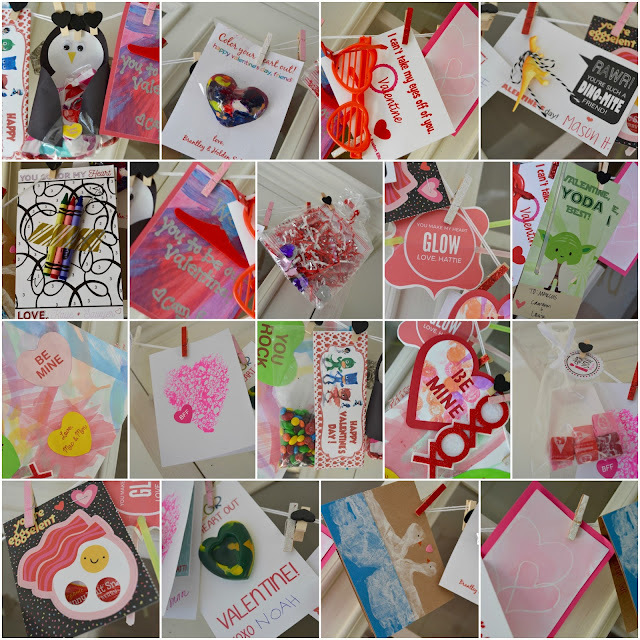 Currently, all the Valentines are on display, hanging from our hutch in our kitchen. 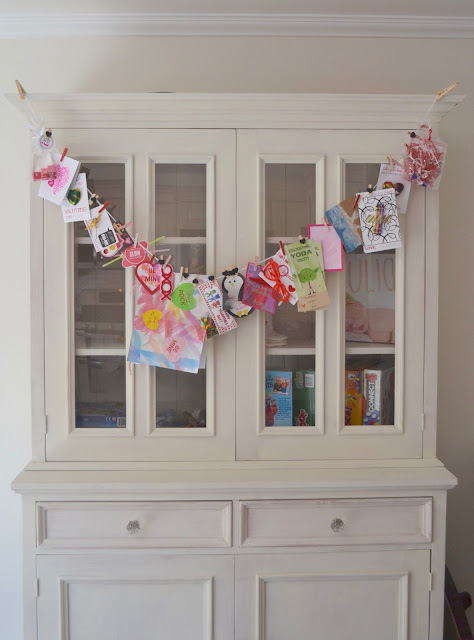 I simply strung some yarn across the top of the hutch and attached each Valentine with fun little clothes pins. 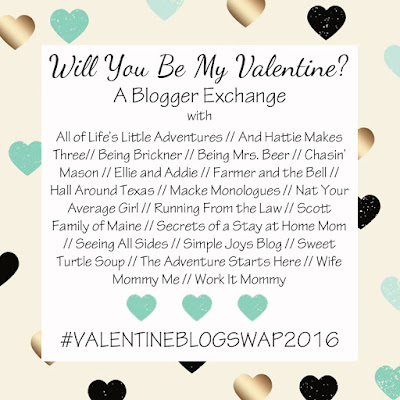 You can also check out all the goodies on InstaGram by searching #valentineblogswap2016! What's on the agenda for your Valentines this year? I love how you displays them!! So cute! Your valentine was a huge hit and probably the favorite in our house. Cam LOVES it!! Such a great idea. The valentines you made are adorable! I love how you displayed them, too! And the winner is you!!! Because s'mores of course :). Such a cute bunch of valentines. These were so adorable! Elin was so excited when she saw the M&Ms and then you should have seen her face light up with the flashlight! haha! Kids just love flashlights. Oh how cute!!! I love how you displayed the valentines! They look great and so festive. Mason (and I) really enjoyed your valentine! I ate the M&Ms the other day and he ate the graham crackers and we were both happy campers (he is not a super chocolate lover so you know, I had to take one for the team lol). Such a cute theme! We loved them! Love how you displayed these! I did something similar, but I like yours better! 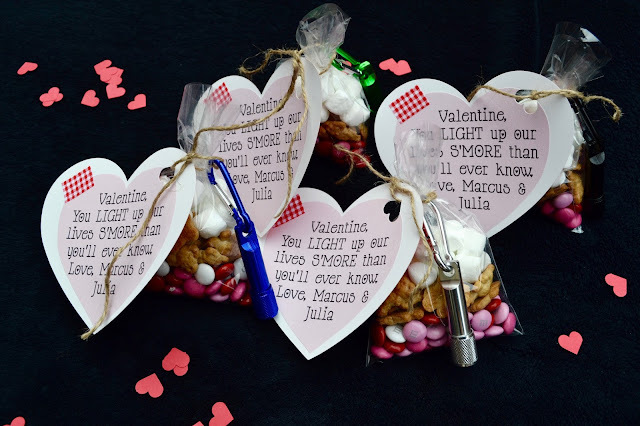 Your Valentines were a hit in our house--marshmallows and all! That's such a unique idea! Your Valentine was the big winner at our house this year! Flashlights, chocolate and marshmallows? You know EXACTLY the way to Mac's heart. Yeah Aria definitely loved your the most! I think it was the second or third opened and all she wanted to do was eat the marshmallows. Open a card. Eat a Marshmallow. rinse and repeat, lol. Mason loved this!! He was so excited about the flashlight and went straight into "spy" mode! Boys and their wild imaginations, gotta love it. 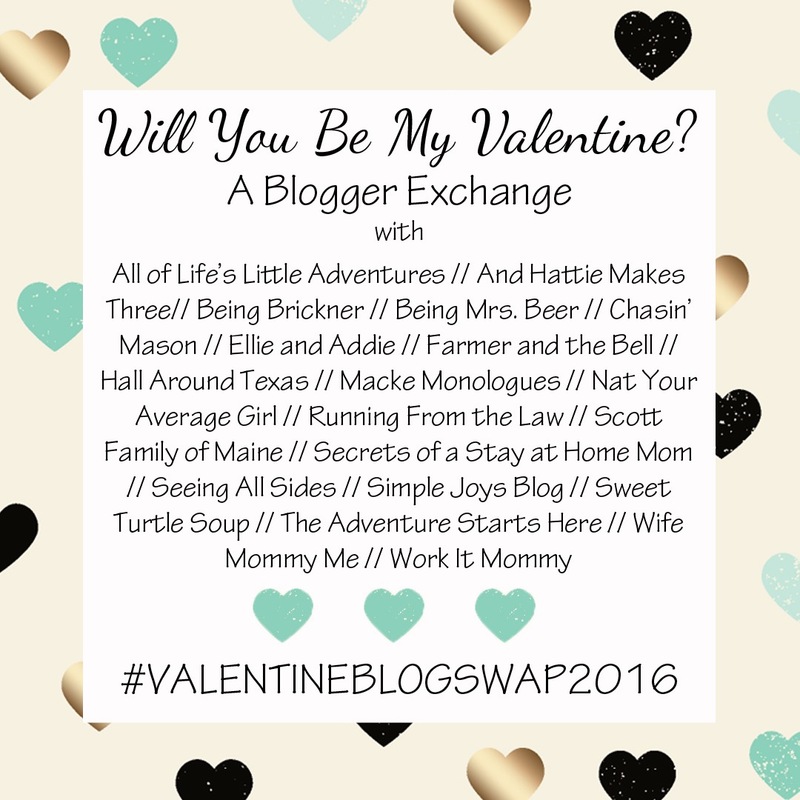 So happy to have been in this exchange with you sweet lady! These were the greatest Valentine's!!! My husband is trying to steal the girls flashlights ;) I'm going to be making that s'mores mix every holiday! You can't go wrong with s'mores, EVER! UM ... we were OBSESSED with these! Like seriously, good job mama (and babes!)! and now i want chocolate, marshmallows, and teddy grahams. which happens to be one of my FAVORITE SNACKS EVER. Friday Stitch Fix Five.... HUNDRED! !